UPDATE—March 13, 2017: The Quipu catalytic commons project was a precursor to the ACCESS to GOOD platform, ready for launch in 2017. The way we get information about the economic landscape is skewed toward those who benefit from policies enacted in the interests of those already in power. In other words, our economic informational system is skewed toward the privileged, and effectively perpetuates a “trickle-down” model for measuring progress, even as the same system produces numbers showing that model is not adequate to fomenting sustainable economic frameworks that secure and advance the democratic possibilities of an expanded middle class. The better our leading economic indicators do, the better the wealthy do, and eventually, we hope, that “generalized” prosperity will go far enough to allow new affluence to reach those not already enjoying the boon and squabble of perpetualized growth. The financial collapse of 2008—which to many seemed a mysterious “perfect storm” of real estate market correction, unraveling mortgage-backed derivative securities and extreme indebtedness among households and small businesses—was in fact, measurably and crucially, the result of too much consumer spending capacity having been transferred to those who least need to spend or invest to sustain their quality of life. In other words: instead of new income and spending power, middle class asset holdings and equity were replaced with record debt, a major transfer of wealth to the financial sector and its most affluent clients. What causes money to move through our economy is not well-enough understood, if we assume that such a dynamic can be sustained, and what is missing is the voice of those who are not considered by the economic reporting infrastructure at work in shaping the policy espoused by public officials and major investors. Project Quipu aims to build a user-made economic atlas of activity at the human scale. The purpose of this project is to allow stakeholders normally excluded from economic policy negotiations to not only have their say, but to correct vital misconceptions communicated by a flawed and incomplete economic reporting model and to steer policy—locally, nationally and internationally—towards a more intelligent response to the problems facing humanity in our world, as we live it. One key feature of the Quipu.cc project is the principle that economic information affects all people everywhere. The word “stakeholder” is often treated as a euphemism for those victimized by policies directed at benefitting powerful interests. But the protection of such stakeholders also protects each of us who are not directly victimized by those particular policies. It does so, because at any given time, policy decisions are being made that will affect our lives, through the fabric of economic activity; often, these are governmental decisions that will affect us through the private market economy, and often it is so-called “free marketeers” who champion that very process, whereby decisions made in government offices benefit them to the detriment of the overwhelming majority. 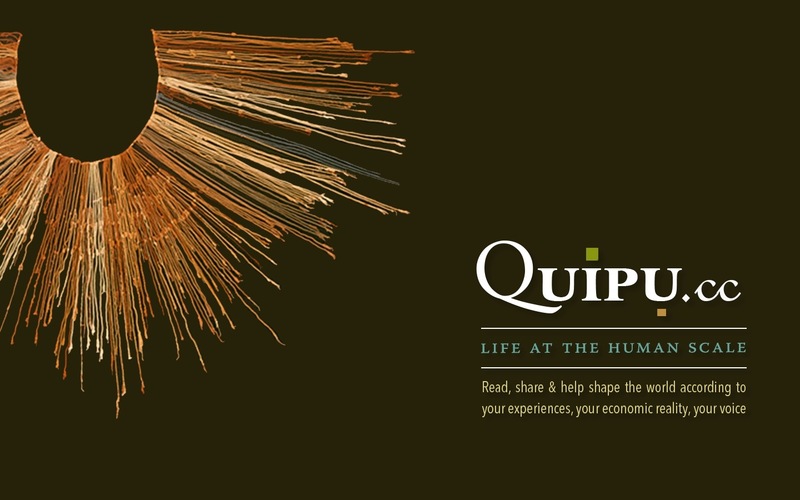 Quipu is intended to shed light on the misappropriation of resources, the forceful redistribution of wealth, by the often flawed structural mechanics of political and economic power, and the many ways in which misunderstanding of economic reality contributes to or actively determines the degraded condition of so many human beings and communities across the world. The quipu [pronounced keep-ü] was a system of strings, knots, colors and patterns, created in each case by the individual agent whose job was to oversee the history of taxation and tributes offered to the Inca (the emperor of the realm of the Incas) by his subjects in a given region. It provides an evaluation of geography, social composition, currency and chronicle. The quipu was used to evaluate the state of economic and political affairs through a dynamic system of spontaneous coding, a system open to the introduction of new elements, categories and coding patterns, at nearly any time. The quipu’s creator might have been the only living soul able to fully decode its meaning, which was, in itself, a way of establishing enhanced economic value in the work of formatting and maintaining the document itself. Power could be decentralized through the artistry of the individuals who coded the documents through which the poetry of human need, alliances and relationships, was to be conveyed. Project Quipu is an endeavor to create a global economic forum, a user-made atlas of economic information, reporting, negotiation and planning, in order to craft a more relevant, human-scale model for economic information and application. Examining the manner in which financial news is reported in the popular media, the HotSpring Network proposes to create a system whereby live-update, rss-technology, micro-blogging, spontaneous video creation, and financial and editorial expertise, come together to produce a reliable up-to-the-minute resource for evaluating broad economic trends and engagements, without limiting analysis to single-parameter references like GDP, stock indices or government-generated statistics aimed at assessing employment, consumer behavior or the viability of a given rate of interest for a given financial service. It is often thought that in order to organize ideas or to put some kind of order to any analysis, one needs uniformity, a limited number of generic categories and a single system of uncomplicated parameters by which to categorize each subject under review. But the truth is, this uniformity is not and will not be the rule of any part of lived reality. Complexity is much more the rule in human experience, and we need to find ways to intelligently assess and address the complexities that actually influence the situation of any given community at work within the economic landscape. To emerge from the fog of flawed, incomplete and opportunistically limited economic and financial analysis, means we need to come to grips with the fact that all resources, all functions or ‘services’, be they natural or the product of human ingenuity, figure somehow in economic values at all levels. There may be no clear way to quantify their contribution or mercantilize them, but they are there, and nothing can be fully understood in economic terms without seeing this. An equation that balances out only because inconvenient variables are ignored does not tell the whole truth. We could calculate, for instance, that to do by artificial means what nature does of its own accord in a handful of basic environmental ‘services’ (such as climate stabilization or the global fresh water supply—avoiding discussions of such complex processes such as new species evolution, deep-sea current patterning or ultraviolet light blockage and refraction)—we would have to spend well in excess of 10 times the entire global economic output (using GDP in sum as a base). And that is for just a handful of basic environmental life-support services. Recognizing this problem in the way we identify and examine economic information helps us to take note of the immense ecological influence we have erased from economic calculations, seeing it as inconvenient or even unquantifiable, in the terms we are accustomed to using. But it does not help us to place a useful economic value on such influence over the economic infrastructure of civilization, globally or locally. For that, we need to find ways to look at what actually happens, at the human scale. It may be enough to say, though this shades all following calculations of any kind in a significant and problematic way, that they are indispensable and dynamic values. They exceed all calculable value of our own activities, which without their contribution would simply not make sense or could not take place at all. Metaphorically, their incalculable immensity could be compared to the way the tides at the edge of a great sea shape and define the shoreline and the kind of activities that can be conducted at that point of contact. It is necessary to think of how such information could then be integrated into a more complete and less untruthful matrix of economic calculations. What parameters determine downward and upward trends, and what do such trends mean for our ‘traditional’ economic footing, financial activities, international treaty obligations on issues like trade, water, farm subsidies, and transportation? These questions only begin to gain relevance when we see that the ‘macro’ view is in fact far broader than the segmented vignette-style of economics we are accustomed to pursuing, for the level of mathematical and sociological comfort it affords. So, everything is very big, all numbers are astronomical, nature is everything and more, we cannot make it all fit into a nice little frame… yes, yes, yes, this is true and it’s a problem. But what can we do to apply this observation to our economic outlook in general or to programming the calculations for this quixotic pursuit of an intregrated generative economics? We first need to correct the errors that are already built into our economic calculations, and which are part of the traditional economic outlook: for example, nuclear energy. Why do we not count the costs of long-term maintenance, security, protecting national technological secrets, pollution clean-up and, above all, the long-term hermetically-sealed containment of nuclear waste? Primarily, because that last figure requires examining the huge costs of sealing radioactive materials in a hermitically-sealed, non-conductive container, immune to corrosion from radioactivity, for between 1 million and 10 million years, which may take us only to the half-life of the radioactivity of the spent fuel. Depleted uranium, for example, which is used as a heavy metal for armor and bomb-casings in US military machinery, has a radioactive half-life of 4.5 billion years. 1 to 10 million years to abide by public health and safety laws and prevent widespread radioactive contamination of the natural environment or of human habitat. We can calculate these costs, but they remain unimaginably vast. Imagine telling a businessman—it is irrelevant whether he is serious or not, talented or not—we would like you to build a nuclear plant for electricity generation, move toward taking a profit after a few decades, maybe make a few billion dollars over another few decades, then pay for decommissioning the plant, clean-up of all dangerous substances or contaminated panels or constructions, then pay all the expenses for containment and security, for 1 to 10 million years, during which you will not be able to take any profit from your activities. The offer would not be convincing. So, in our calculation of the usefulness of such technologies, we need to take very seriously the reality that those costs will be paid or those operations will not be successfully carried out. Though we may see the economic value now, and tell ourselves as a society, it’s worth it to get the gain we get from “cheap” energy now, we need to see clearly what those costs look like, across the entire spectrum of human activity, how they will affect life at the human scale, throughout the life of the project, and what they will take away from us in the future. The calculations need to be wholecloth and transparent. The healthy functioning of any market depends on there not being unreliable pockets of secrecy and deceit where the eye is fooled and the ‘magic’ of economic value just a trick. The founding principle, the goal and the challenge of this undertaking is to integrate and comprehend in an integrated manner the economic, ecological, financial and spending data that account for real long-term viability and prosperity at the human level. It begins in the theoretical realm, and through analysis and discussion, could reach the moment of practical application, likely with much new information technology put into the process. The model will be the physical metaphor of the Inca quipu, a tool for measuring taxation in an empire that combined urban centers, agriculture, nomadic hunter-gatherer bands and sea-faring fishing communities and traders. The problem will be, evidently, how do we program into a matrix for moment-by-moment calculation of an international economic outlook, values we cannot quantify? and, how do we allow for a dynamic, bottom-up intregration of new code, new parameters, and new paradigms into what should be, in theory, a consistent model for evaluating global economic trends, beyond the bounds of the traditionally ‘economic’? These are questions that need answers, and will form the basis of Quipu.cc. Allow for discussion, criticism, analysis and the contest of ideas, to guide us toward a series of solutions that help make such a matrix possible. Quipu.cc proposes as a rule that we not shy away from seemingly impossible calculations, because they likely contain vital economic data which may come to us in forms not quantifiable but in fact relevant and comprehensible, when seen through the adequate lens. One key feature will be timing: as with any economic reality, the moment brings context that cannot be discarded, and two moments which may appear numerically similar may in fact have amply divergent significance. It is therefore vital to understand that any data with real impact will emerge either more slowly or more rapidly than our ability to perceive it, just out of reach of our attempts to ‘capture the moment’. We can provide people across the world with a platform on which to raise their voices, to have a say in the development of policies that will affect their lives and the lives of those around them and who succeed them in their culture and in their region. We can correct the inequities and inefficiencies of intensely distorted markets currently biased in favor of entrenched interests, and so liberate human imagination and potential, to do real problem solving that generates the possibility of real and sustained prosperity not corrosive of human quality of life or of the natural environment. Our project begins as an attempt to observe and to make sense of the global fabric of economic activity, blending high-level reporting with anecdotal analysis, effectively putting global policy-makers and ordinary people at the same table. Join Project Quipu today, and help us start to build a more sensible, more honest, more open, more humane future, in which people from all parts of the world enjoy not only the expectation of basic sustenance, but of dignity, liberty, opportunity and the right to build something smarter than what befalls them. A version of this article was published in the Winter 2013 edition of the HotSpring Quarterly.